One journey I have been itching to do on my new bike is my Thames Path route. This morning I got the chance to do just that and I found the experience quite a difference. As far as I am aware I have only ever completed this route on a Brompton. I am pretty certain that my Condor road bike has not got its wheels dirty heading along the Thames Path? As yesterday was raining and I had other plans anyway, today was my first ride in 2017. As per usual I was up early and there was not a great deal of activity in terms of people out and about. There were joggers, dog walkers, tourists and a photography group - taking arty long exposure shots of people walking along the Millennium Bridge with St Paul's Cathedral in the background - but apart from them, London was very quiet. Crossing the river via the Millennium Bridge and heading towards Southwark I spied some street art depicting, William Shakespeare. I suspect this is as 'The Globe' is but a step away. I do not actually know why I bothered to park my bike up and take a photo of this? (I will get emails about this next bit so look away or steel yourself). I cannot abide Shakespeare. For me his lasting legacy is stupefying boredom for school children across the nation forced to study or worse still actually go and see one of his plays live. If the RSC were performing one of his works art the bottom of my garden and giving out £20 notes, I wouldn't attend. There, I've done it now. I await the emails. London did look pretty good this morning. It was crisp but the sky was blue and there sun was shining. Even the security guard patrolling was in a good mood and wished me a happy new year. 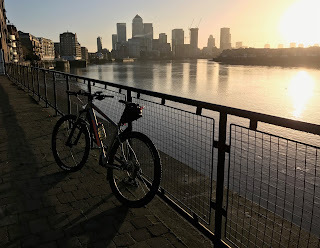 I stopped at the bascule bridge in Wapping not really to take a photo but to have a drink and see whether I liked a new electrolyte tablet I had been sent as a freebie in some cycling gear I bought. The answer was yes and I plan to buy a tube for later on in the year. As I have reported previously I like this new bike a great deal. 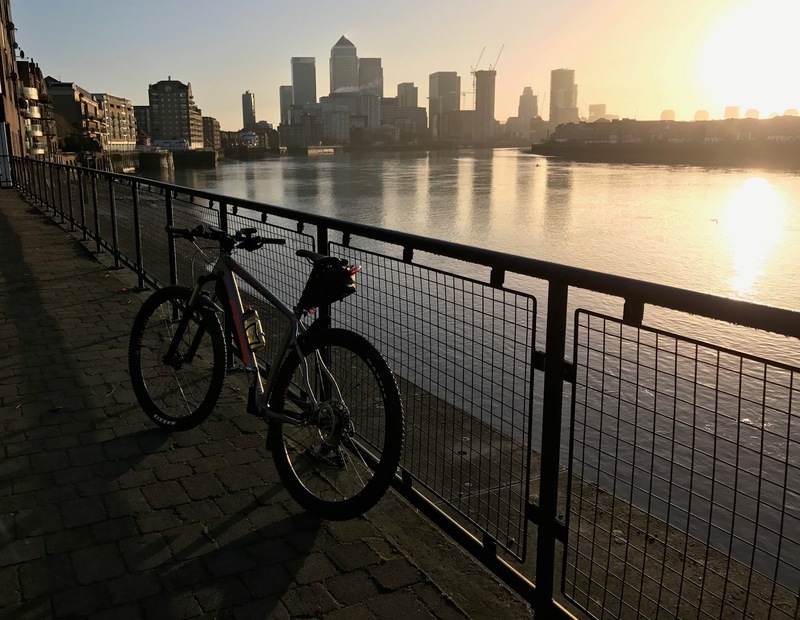 Navigating the cobbles of Wapping was effortless with the big mountain bike tyres and quite superb front suspension. I could also do this at some speed with pleased me greatly. All the photos in this post were taken using my iPhone 7+ and I was experimenting with the 2x lens. The picture above is the normal lens and the one below me standing at the same spot, repositioning but using the 2x lens. Rather clever and it works well. Reaching the Greenwich foot tunnel I had the place more or less to myself. They are testing out a new system which allows cyclists to cycle through at times when things are not too busy. There is a section of the Thames path just before reaching the O2 that has over the years providing a great deal of concern for yours truly. Everything from a small lake, mud, stones, gravel to a combination of all has had to be negotiated much to the amusement of those with me as I muttered and cursed my way through. I could not help but succumb to a little smugness as I feel I could traverse almost anything on this bike. Reaching the Thames Barrier I knew that the small cafe there would be shut. I stopped to take a few photos and was joined by an older gentleman on a mountain bike. He asked for my advise about his disc brakes making a loud screeching when he stopped. I thought to myself, you have asked the wrong person here but not wanting to be unhelpful had a quick look and summoned that they probably needed bedding in. He seemed quite happy with this, thanked me and went on his way. Having reached the Thames Barrier I turned and headed back. I enjoyed the ride and more so because of my new bike. 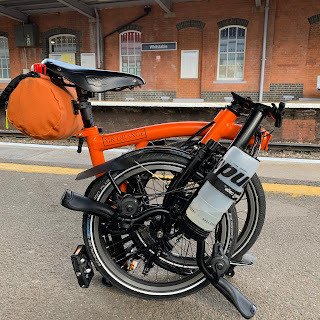 It doesn't conveniently fold into a small package but it is faster, has better brakes, gears and is more conformable over just about any surface. I am I will return with it again in the not too distant future.